Circle of 5ths App is your music teacher, trainer and also can be a portable tool, book, reference, library, cheat sheet and your friend. 1. 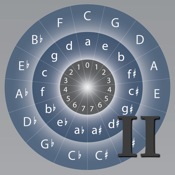 Circle of All – Circle of 2nds, 3rds, 4ths (true 4ths! ), 6ths, 7ths and of course, 5ths; interesting here is that the last key ALWAYS ends with C#/Cb Major or A#m/Abm. 7. Internal structure; stability, memory management, etc.